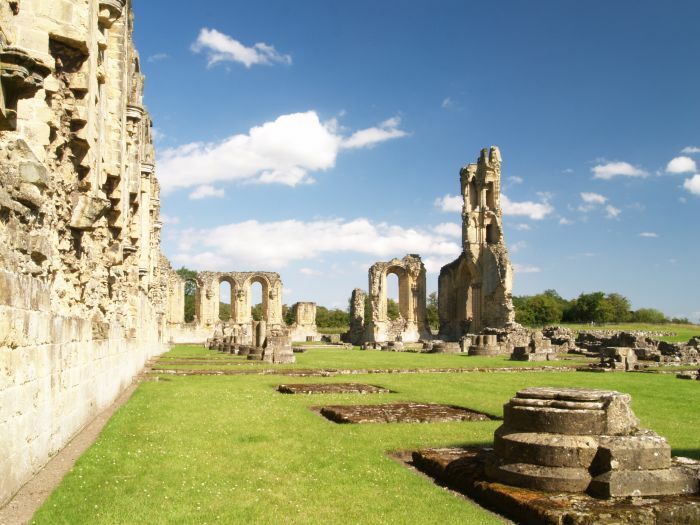 The classic view of the west end of the laybrothers quire of Byland Abbey, managed by English heritage. 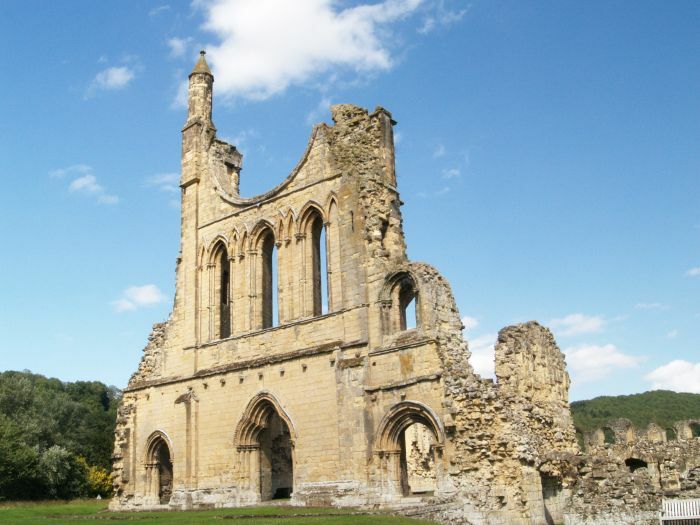 The grand historical site of the ruins of Byland Abbey lie in the rich farmland of the eastern limit of the Vale of York in North Yorkshire. 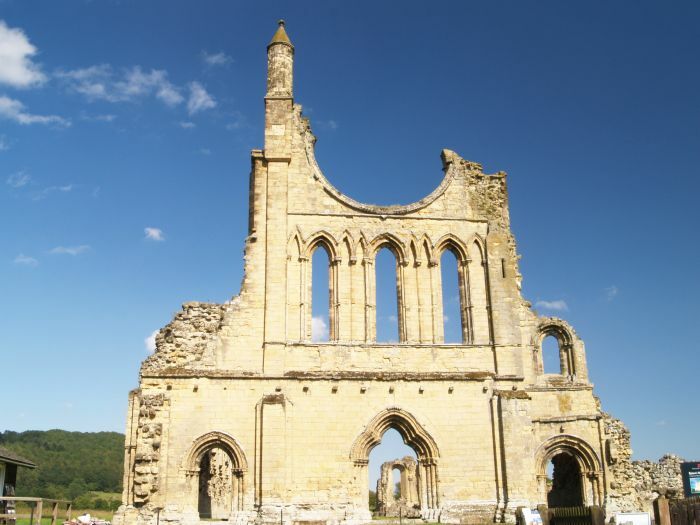 Byland Abbey was founded as Savigniac house in 1134 but was incorporated into the Cistercian order in 1147, but consequently ,suffered grievously at the dissolution of the monasteries in the late 1530's onwards but lives on as a major tourist attraction in the area. 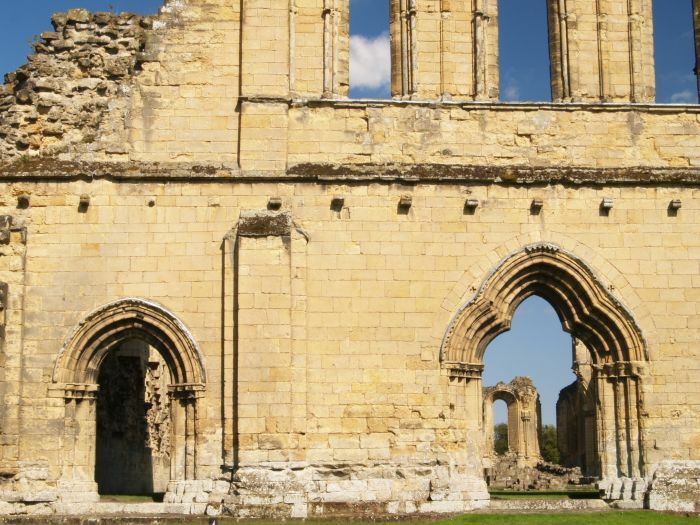 some architectural features - details of the west front door entrances - slightly pointed archway of the left-hand door and the more elaborate pointed arches of the right-hand door (its actually the main middle door, another less elaborately carved doorway is to the right - see first two pictures above). 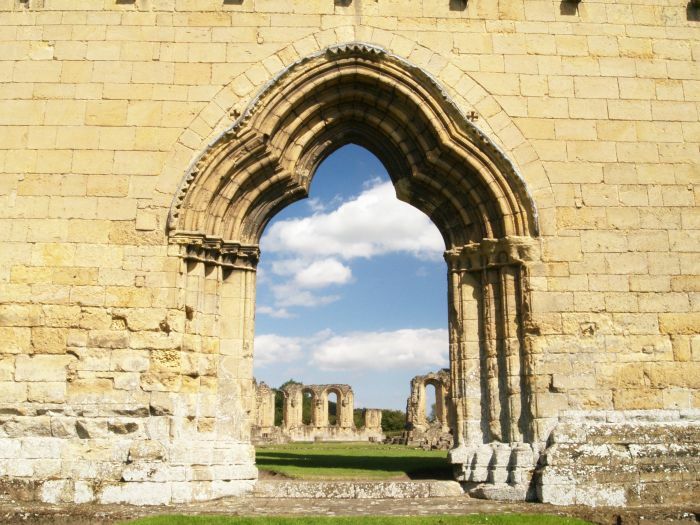 Looking due east through the main west door into what was successively the laybrothers quire, retroquire, monks' quire and presbytery at the east end - the curved arches of the windows of the far eastern wall can be seen in the distance. 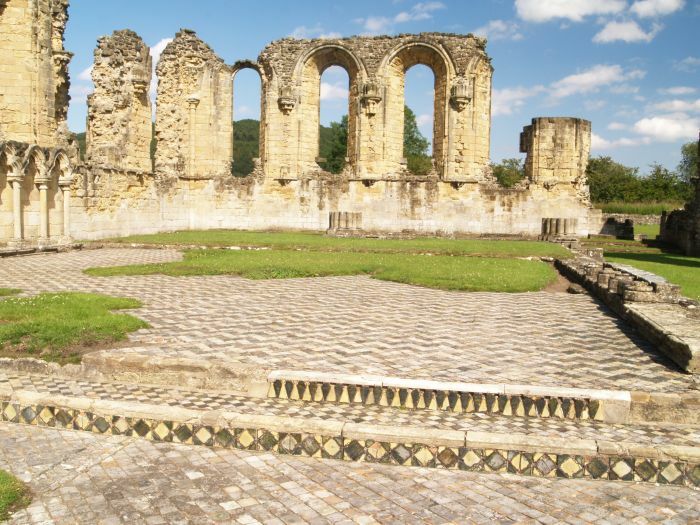 The tall structure is much of what is left of the south transept. 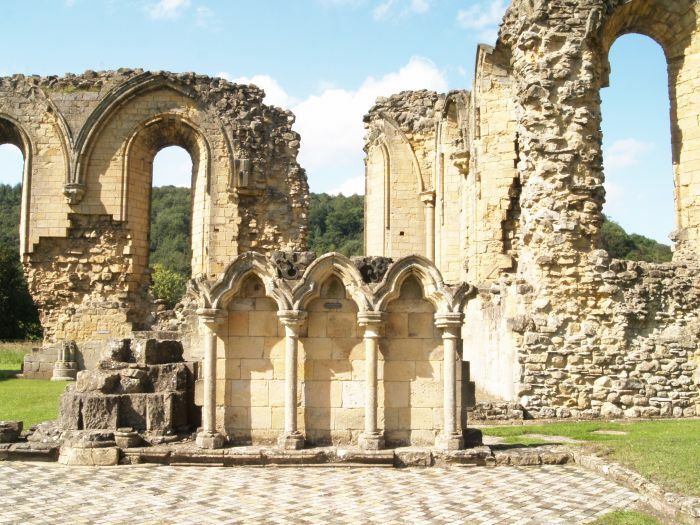 Looking from what was the monk's quire into the ruins of the north transept. 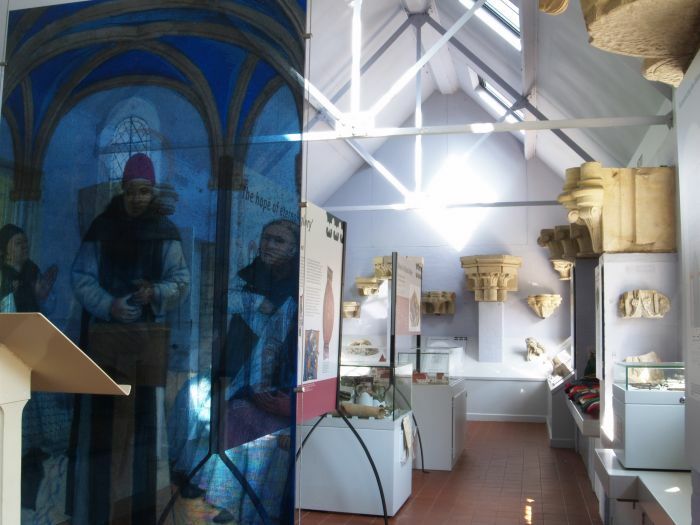 Looking towards the east end of the presbytery and in the foreground some of the justly famous, medieval tiled floors and steps. 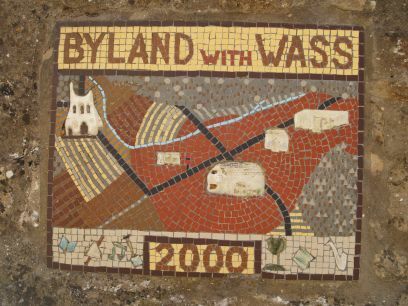 These tiles have lasted well! 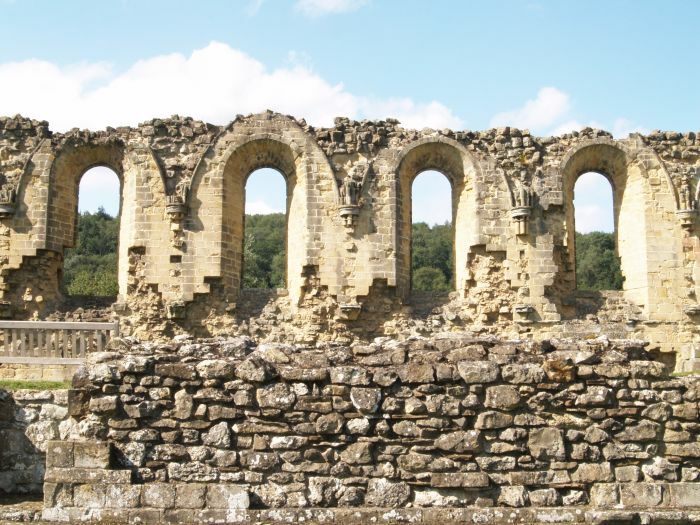 Some details of the north wall of the laybrothers quire and retroquire - note the older style of window - the curved arch of the early Norman or Romanesque style of architecture. 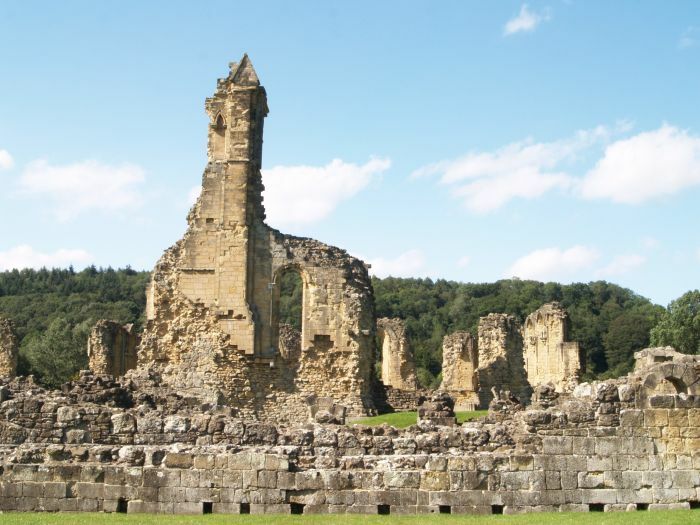 Byland Abbey Museum, telling the history and development of this monastic settlement. 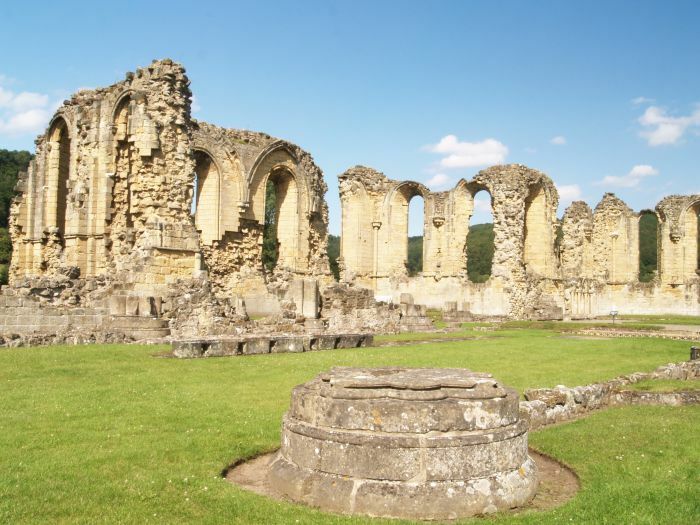 The picture shows north side of the Abbey which is reasonably intact. 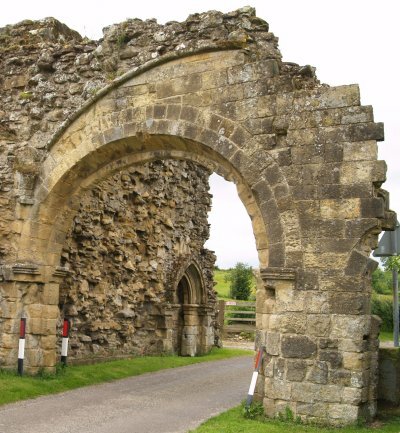 Just up the road across from the Abbey entrance is a gateway entrance arch into the original medieval Abbey precinct. 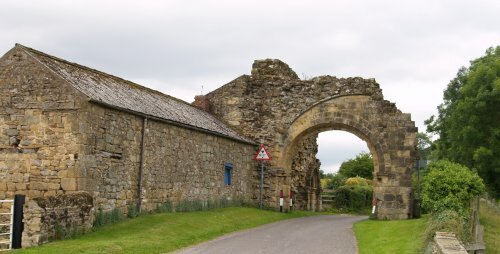 Note the fine little doorway beyond the arch on the right. 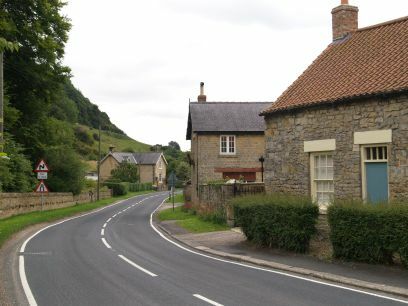 The rich farmland of the eastern limit of the Vale of York in which the Abbey is set - the North York Moors rise up to the west. 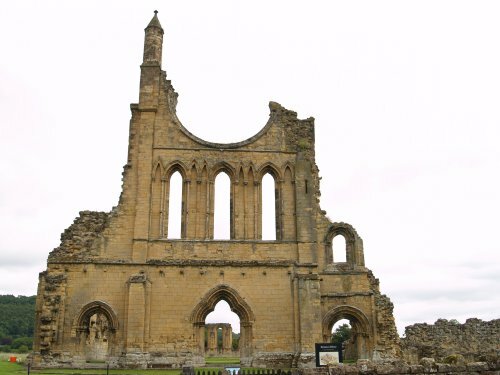 The great 13th century west front of Byland Abbey, showing a mixture of Romanesque (round arches) and the later Gothic (pointed arches) architectural styles. 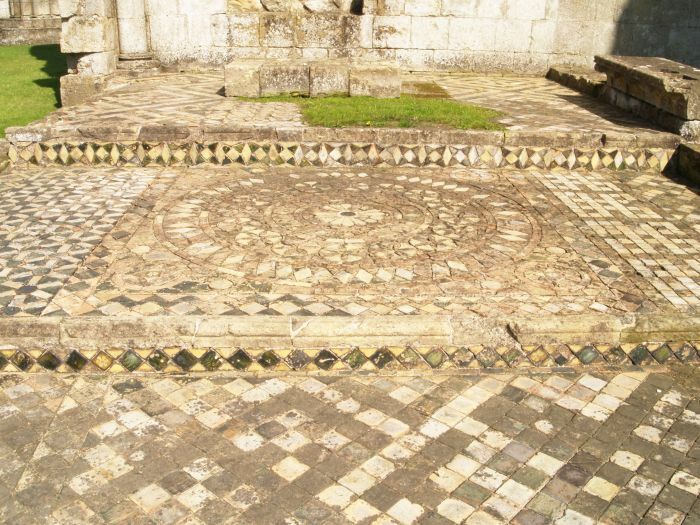 The 'iconic' lower half of the stone frame of the great Rose window stands out in a prominent and stark manner. 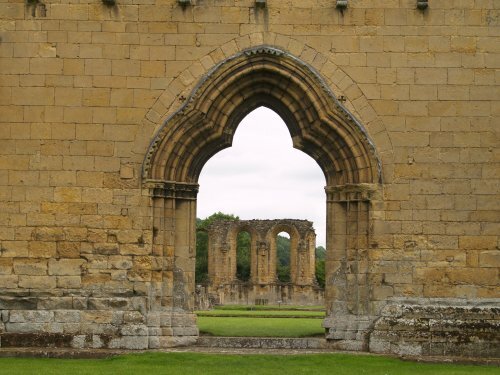 Detail of the west front door entrance-gateway (Gothic) with the east front windows (Romanesque) in the distance. 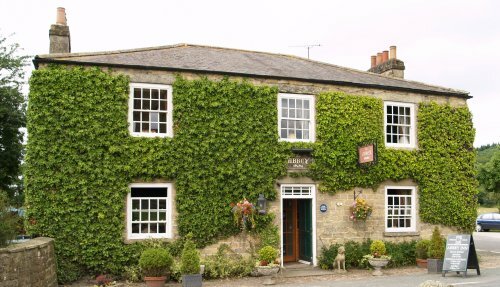 Just across the road from the Abbey entrance is the Abbey Inn. 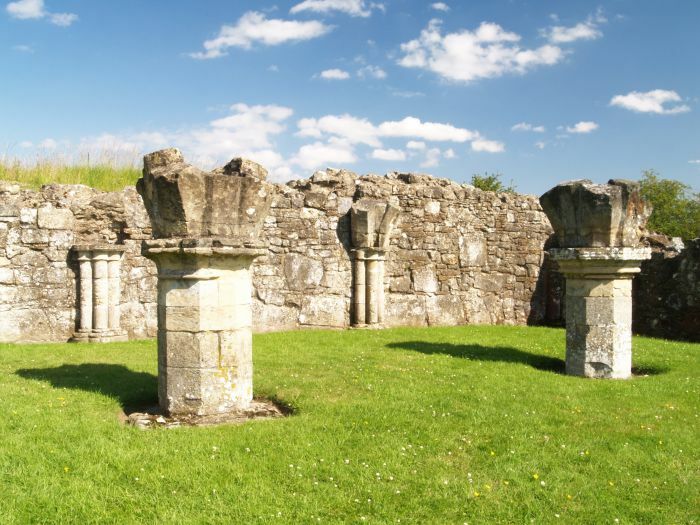 a good place for a little refreshment for the visitor on a busy tourist trail, before or after visiting the Abbey for some peaceful repose or picnic! 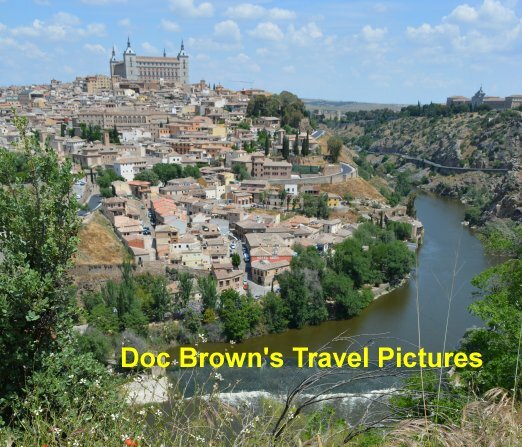 It was originally a medieval building within the Abbey precinct, then a farmhouse and in 20th century became a 'pub' and restaurant, which I'm sure the monks would have approved of! 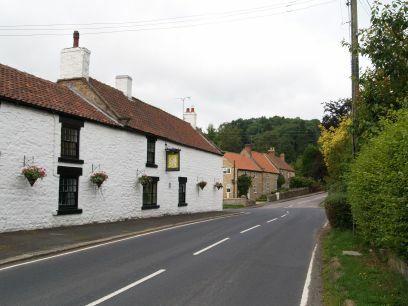 The small quiet Village of Wass, North Yorkshire, is half a mile north-west of Byland Abbey and the Wombwell Arms is good pub to call in for bar food, restaurant meals and drinks in the poachers bar! 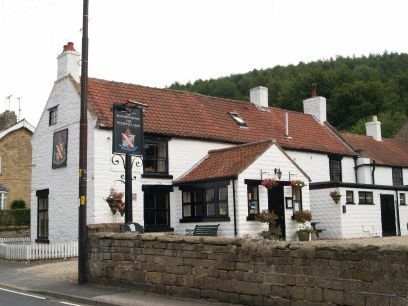 It started life as a granary in 1620 and became an ale house in 1645. 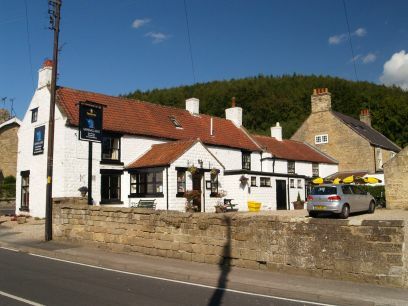 It has plenty of character and the inn is set in the beautiful countryside of a small south facing valley on the edge of the North York Moors. 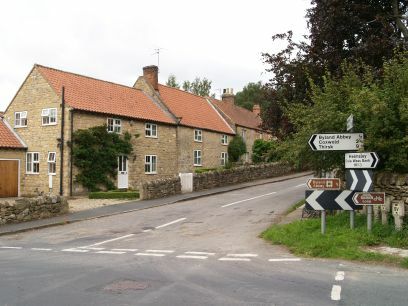 Enter place, village, walk, feature, church, anything!